I swear, if I wasn't running late for my second event of the night, I would have stood up in the theater and did a long slow clap after watching the Austrian horror, GOODNIGHT MOMMY. Not only because it was great (and deeply disturbing), but because I think I have been so deprived of good films that this one came as such a needed welcome. Seriously, it is the only "awards worthy" film so far this season that is actually worthy of an award. (Yeah, I said it). 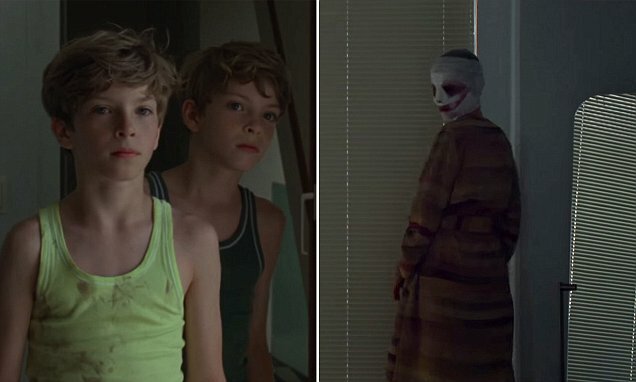 GOODNIGHT MOMMY came out a few months ago in the U.S., so you've probably already heard that is not what it presents itself to be. In fact, it is way, way more demented. Unlike too many modern mainstream horror films, this one takes time for the audience to get to know each of the characters and their surroundings, building an unsettling intensity the whole time. What we know right from the beginning is that Lukas and Elias are 9-year-old twin boys who spend most of their days roughhousing and running around their spacious yard --and as far away from their now unrecognizable mother whose face is completely hidden behind layers of bandages. Unusual personality shifts like completely ignoring one of the twins, locking them in their room, and generally being both physically and emotionally distant toward them lead Lukas and Elias to believe that their real mother has been replaced by some evil proxy. And so, they react accordingly. While it doesn't spark endless conversations like, say, A Girl Walks Home Alone at Night or Babadook, there is something special about GOODNIGHT MOMMY in that it has an compelling enough plot that doesn't rely as much on socio-political commentary as it does genuine eeriness and rage--classic horror devices. Writer/director team Severin Fiala and Veronika Franz are exquisite at building and sustaining intensity throughout the film, which you never know which direction it will take. Showing a mastery in creating moody atmosphere in even the smallest of rooms, both filmmakers seem to understand that the audience may guess the crazy ending beforehand. But you're still squirming in your seat as you watch the increasingly creepy events unfold. My theater got this, but I skipped it. I spoiled the ending for myself and it felt really typical. I'm sure I'll give it another shot on DVD. I'm glad you liked it.